So your ready to take out a Bitcoin Loan! First, to set your expectations out on the right foot is the paradox of loans. So if you are in dire need of a loan and you need it now, please reconsider and evaluate on if taking out a loan now is a good idea. 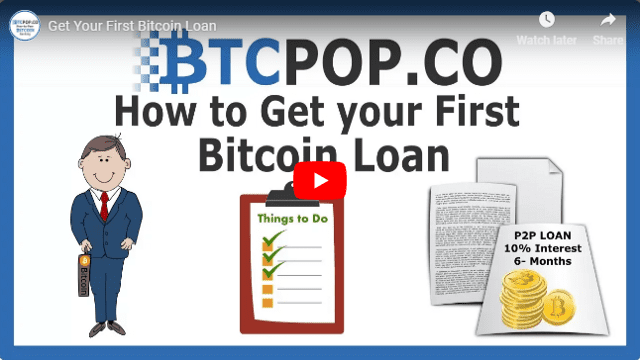 If you want a loan, but don’t necessarily need it below are the steps to get you your first Bitcoin loan at Btcpop. A. Sign up and create an account: Create a username (and write it down to remember) and a nice strong password. Please take care in picking your username, it will be your identity on Btcpop and will be how investors identify you and choose whether or not to invest in your loan. After you create your account using your email, you will login using your username not your email and the password you just created. Here is a guide to help you set up a secure account. B. 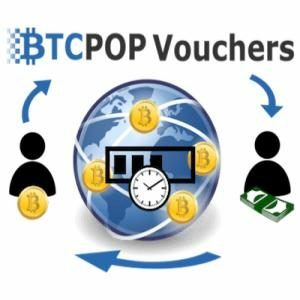 Get Verified at Btcpop: Getting verified connects your identity to your username. 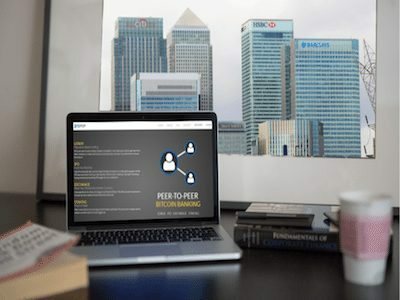 Investors are people just like you, and would you invest in someone without a linked identity? I’m guessing no, so its important you link your identity. Go to your profile or the Apply tab on the left toolbar and find “Get Verified” button. From here I recommend you verify everything possible in order to gain the most confidence from investors. General Identity and address verification: Enter your Name, Birthday, and Address into the fields. Please note that you must use the address you are living at and the one that shows up on your drivers license, passport, or identity card. All users will need to do Address+ Verification before continuing. Address+ is the sending of a physical letter in the mail with a activation code on. Your letter will cost you around $3 in Btc and it will look like this in the mail. 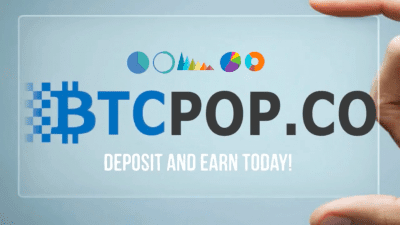 C. Build Reputation: Btcpop is based off of online reputation and collateral. Reputation is not something that is gained quickly, easily, or cheaply. The sooner you start building your reputation the better. Below I am going to list some constructive methods for building a reputation. Please note that these methods do not guarantee you a loan. The market makes the end decision on whether a loan gets funded or not. 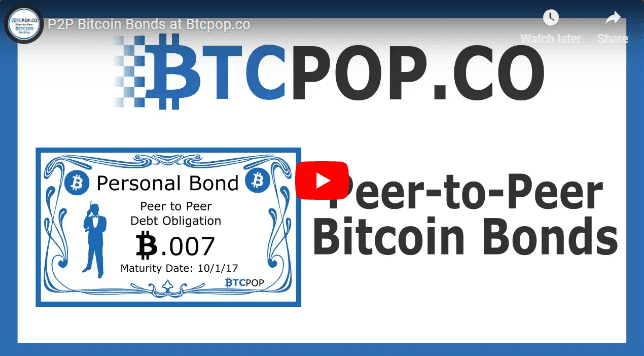 Buy and hold Collateral: The #1 and best way to build reputation on Btcpop it to take out and repay a collateral loan denominated in BTC. This again follows the paradox of lenders wanting people who don’t need loans, but taking out and repaying collateral loans builds the most reputation the fastest. I would recommend having 100%+ in collateral for your first loan. So if you have .5 Btc in collateral, I would list a loan offering for .5Btc or less. 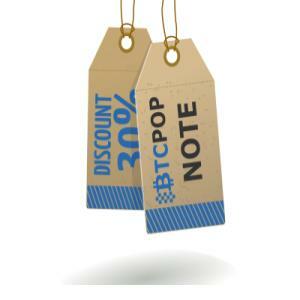 Collateral Types: Collateral at Btcpop is 1 of 2 things, Shares or altcoins. 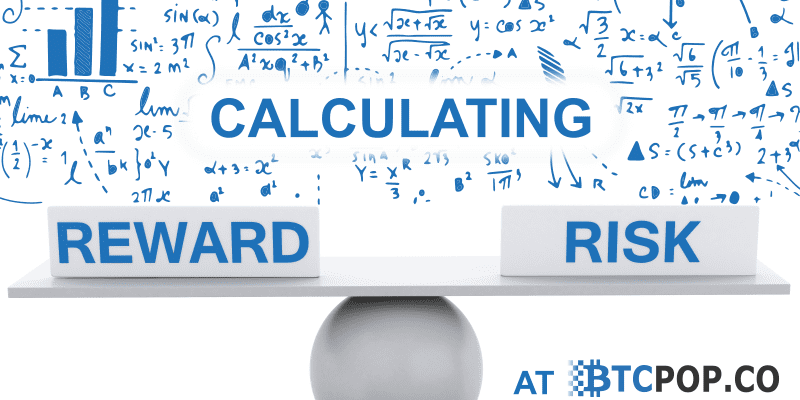 Collateral value is calculated by multiplying the number of assets you have by the last traded price on the exchange. Once the loan is listed the collateralized assets become locked and can no longer be sold. You can still add more assets though. 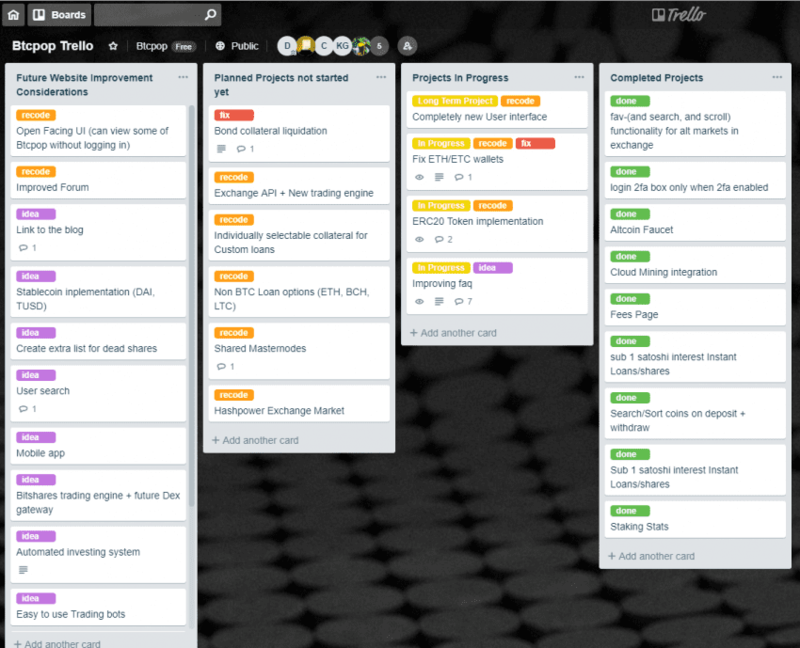 For more information check out this blog post on altcoin collateral. Shares: Shares are exactly what they sound like. 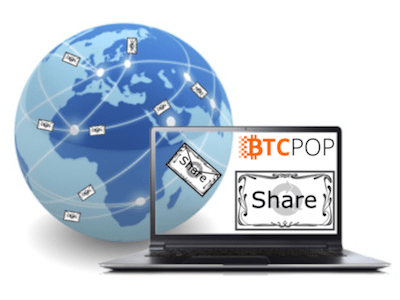 Users and companies can list or host their shares on Btcpop’s share platform where shares are securely held by Btcpop. Share issuers are easily able to pay dividends and communicate with their shareholders through the platform. Shareholders are free to buy and sell their shares on a market, and they can also use these shares as collateral. Each share will have a market price, and represents a stake in a company as listed in the share overview section. 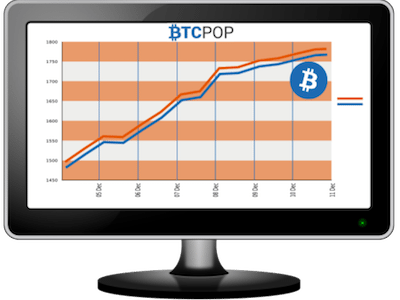 Btcpop shares are the most highly regarded of the 53 share types currently on the platform at the moment for collateral. 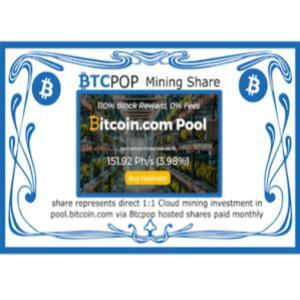 For more information on shares check out this blog post on P2P Bitcoin shares. 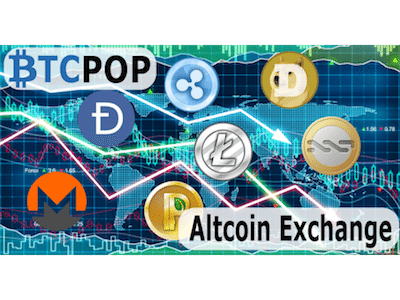 Altcoins: Btcpop hosts an altcoin exchange with 100+ altcoins that you can buy, sell, and hold. 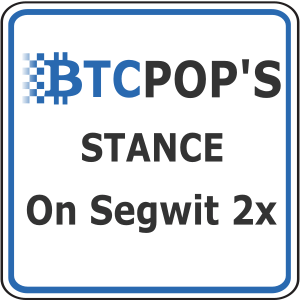 As Btcpop is still young, the exchange volumes are pretty low. But you can easily deposit different altcoins into the exchange buy going to the exchange and generating a deposit address by clicking “wallet functions next to the desired coin”. 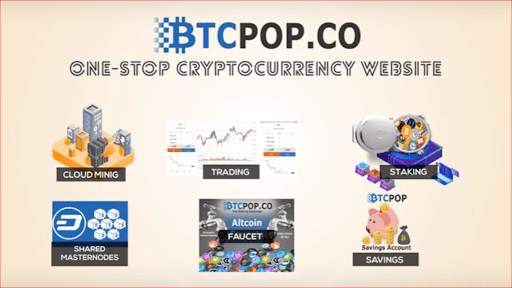 Click here for more information on using altcoins at Btcpop. While it is never a guarantee, porting over your reputation from other platforms (especially Bitcoin Loan platforms) helps your reputation significantly. 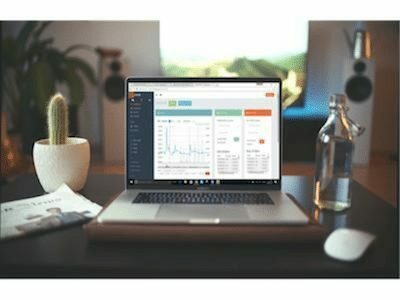 If you have built a strong reputation online on places like Bitbond, localbitcoins.com, paxful, btcjam, bitcoinlendingclub and so on. Please share your account and provide proof in one way or another that you own that account. List links to those profiles on your loan listing and the more proof you can provide that it is your account the better. I personally recommend using google photo links or links to documents/screenshots from google drive. 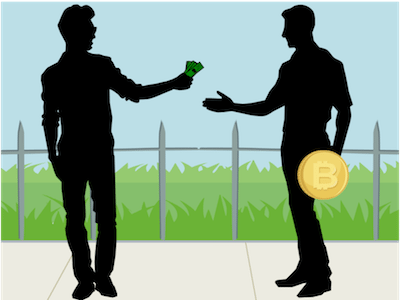 Get a fellow user on one of those platforms to vouch for you: The Bitcoin lending community is still quite small, so there is a good chance that you run into someone you have done business with or seen on another platform before. If you can get that person to vouch for you, it can go a long ways towards earning you reputation to get your loan funded. The effectiveness of this depends on the reputation of the user that is vouching for you. First Set your Profile picture: Humans are much better at remembering faces (or profile pictures) than they are at remembering usernames. Go to your profile and set a original picture. 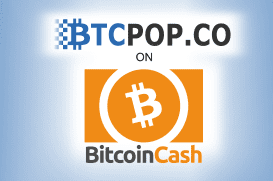 Also fill out a bio describing what your goals are at btcpop or purpose for being on the site. you would be surprised how many people look at this. Invest in loans: No matter how small of amount, invest in some loans. You will learn a lot about the process by doing it. Once you invest even 1 satoshi, you will be enrolled in email alerts for comments. Here you can learn a lot about the do’s and don’ts of loan requests. 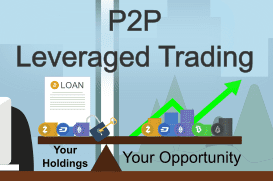 To learn more about successfully investing in P2P loans. D. Taking out your first Bitcoin loan: I would recommend waiting a week or a little longer (unless you have collateral) to learn the site, participate in loans, and build reputation before asking for a loan. 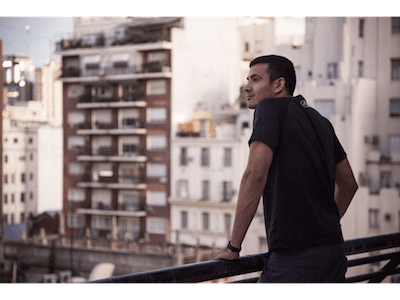 Below I am going to list some methods for getting your first loan, these again are just guides and I cannot guarantee these work, the market will always choose. The first step is to pick your loan type. 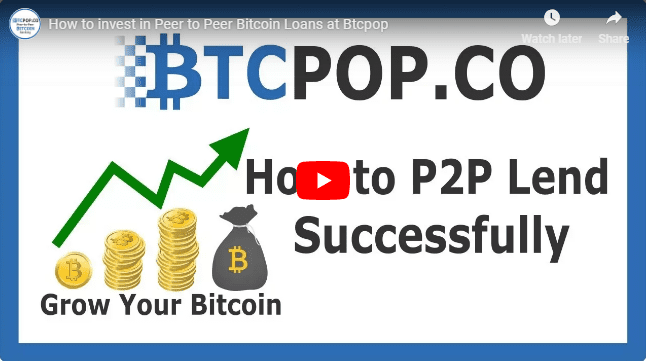 Instant and Instant Collateral Bitcoin Loans: If your a little shy and don’t want to create an investor funded loan yet you can use Btcpop’s instant Bitcoin loans to build some reputation. Your instant loan amount will start very small and increase as you pay them back. And build reputation. You can increase your limit by adding collateral and taking out a “Instant Collateral Loan“. If you have collateral I recommend using it as your limit will be higher and the interest payments will be less. And of course always pay instant loans back on time or earlier to build positive reputation. **Please Note: Instant loans are the most expensive way to build reputation. It is a good tool to use, and definitely builds your reputation, but it doesn’t guarantee investors will invest in you when you list a custom loan. So don’t go broke taking out instant loans. Fun Fact: You do not have to be verified to get a instant Bitcoin Loan! Custom Bitcoin loans: As mentioned earlier collateral is the #1 tool to use when building reputation, if you have it use it. To create your first loan go to “Apply” in the left hand toolbar and select “Get a Custom Personal Loan”. Below are some pointers to creating an effective first loan request using collateral. Title: Create a short descriptive Title for what you are trying to do. 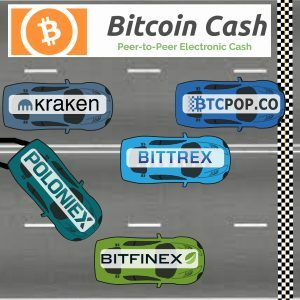 If you are just trying to build rep try a title like “First loan to test out Btcpop”. Carried Reputation Loan: If you are porting over reputation from another platform I would say ask for at most 1/10 your reputation at another platform. 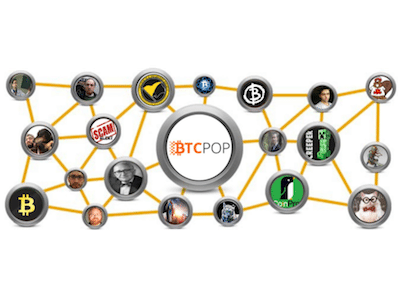 So if you have a previous Btcjam account where you were able to easily borrow 10 Btc, I would start with 1 Btc or less at Btcpop unless you have fellow supporters already at Btcpop who you think will fund. No Collateral Rep Loan: I don’t recommend asking for more than .02 Btc to start out or 20% of what you have already paid back in instant loans. So if you have taken out and paid 1 Btc in instant loans .2 Btc would be the absolute max to try loan with a custom. You can raise it from there, but start out small and make your payments on time. 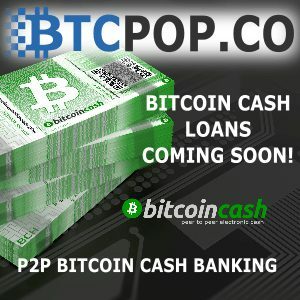 Tied to: At Btcpop you can tie your loans to many fiat currencies. I recommend you tie your first loans to Bitcoin. 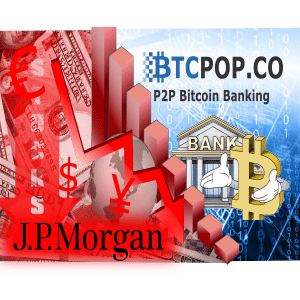 Investors at Btcpop mostly prefer Bitcoin denominated loans and I would say 95% of all loans are denominated in Bitcoin at the present time. Loan length: For your first loan its up to you, but I recommend a shorter length such as 1 month. 7 day loans are ok for rep only very small loans. Payments Every: Select 1 week if possible. Investors have a preferance for smaller more frequent payments. 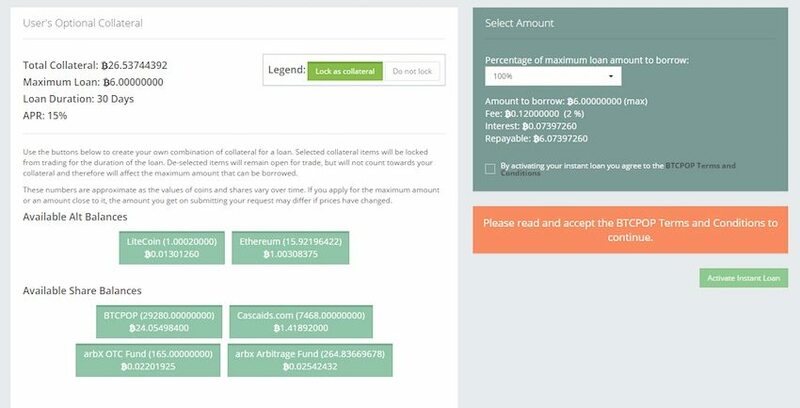 Use Shares and Altcoins as Collateral button: Select this button if you have collateral and want to use it as collateral for your loan. 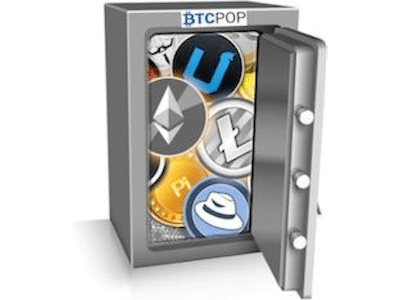 Lock Funds in Btcpop: You will not be able to invest, trade, or withdraw when enabled button: Locking Funds in Btcpop is the next best thing to collateral. 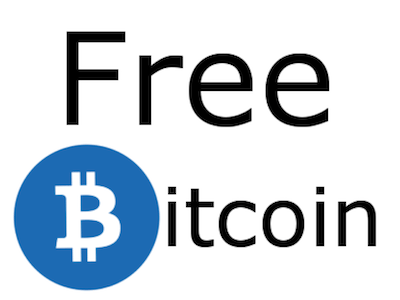 This locks your funds so you can only use them in Btcpop to pay off existing debts. Investors like this function and will be much more likely to invest when they see it. 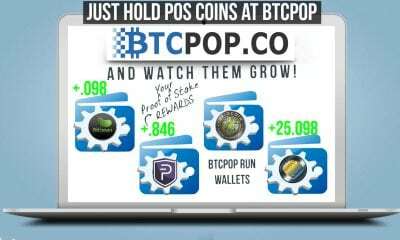 But remember, once you lock your funds in Btcpop, you cannot use them. So this is good for reputation loans, but not necessarily loans you are trying to accomplish anything. 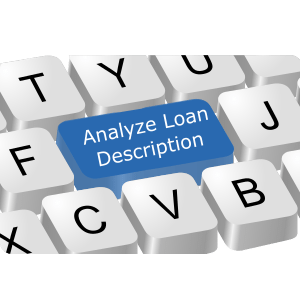 Description: Naturally the description of your loan is one of if not the important part of your loan. Investors will always read the description and it has a big impact on if your loan gets funded. Below are some recommendations to writing a description that will get your loan funded. 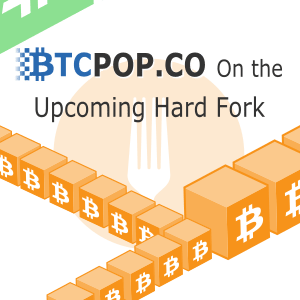 Introduce yourself: your name, what you do for a living, your involvement in Btc ect…. References to your reputation elsewhere on the web: For example share your localbitcoins.com profile if you have a good reputation there. Ebay, Paxful, Btcjam, BitcoinLendingClub, Bitbond or a host of other sites with reputation related to Bitcoin loans. Add a video or other media if possible: You can upload video directly. 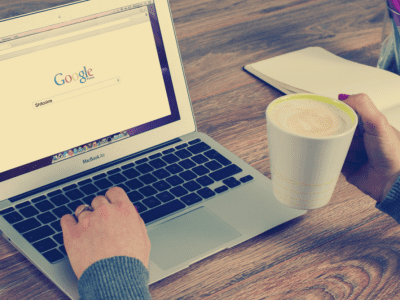 Otherwise use links such as google docs and google photos. Managing your listed loan request: Once you list your loan give investors a chance to view it before you start panicking or making adjustments. Encourage investors to ask questions, and answer those questions promptly. Don’t Cancel your listing: If the market didn’t quite accept your loan, let it expire and then list a new more favourable one. 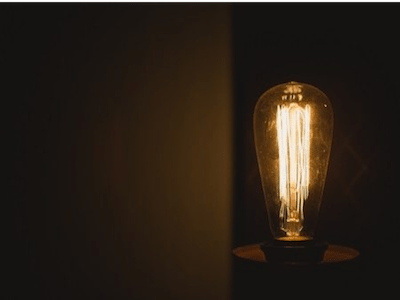 Promptly answer investors questions in the comments: Prompt intelligent answers to questions in the comment section of your loan can inspire confidence in investors and they could increase investment in your loan. Thank your investors: Before your listing cancels for not getting funded, thank your current investors in the comments and share with them your plans for your next loan offering. 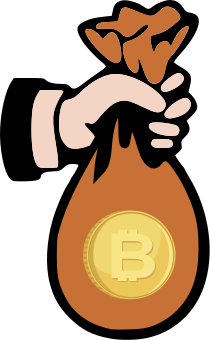 E. Paying back your Bitcoin loans: Once your loan has funded make sure you keep track of when the payments are due. Late payments are very harmful to your reputation. Your loan is accessible via “Payments Out” tab under Account in the left hand tool bar. Have funds ready to go 2-3 Days in advance: Currently the Bitcoin Blockchain can become backlogged with transactions due to the 1Mb block limit. 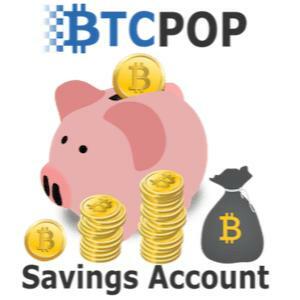 I recommend having the funds in your Btcpop wallet 2-3 days in advance. Better yet make your payment early. This is good for reputation. Late payments are expensive and harmful: There is a late payment fee if you are late and it is very harmful to reputation and will stick to your profile forever. Communicate with investors if there is going to be a delay: Communication is key and can save you a lot of trouble. If something comes up share right away on the loan comments as well as your plan to resolve. Make partial payments if trouble comes up: Always always pay whatever you have. Even a 10% partial payment can go a long ways towards keeping investors trust if issues come up. 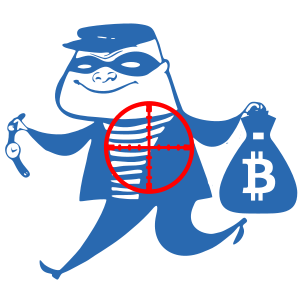 This guide is meant to be a resource to help new users take out their first Bitcoin loan. Nothing stated is guaranteed to work. If you have any further questions please comment on this blog post so we can edit the guide and address them. I am new here. This is very good article for a beginner like me. I will take one step at time. I will have my account verified 9and this will take time because the code will be posted to my address before I can get back to verification again0 and I will buy some bitcoins and then i will eventually get a loan. I want to get a loan so that I can expand my business. ola e isso funciona mesmo? I have bitcoin and ethereum. What do you recommend? 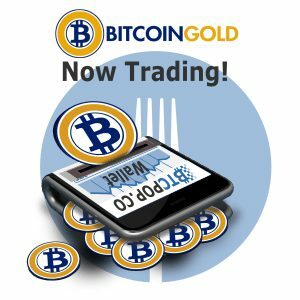 All of the exchanges that have margin trading let you loan/borrow BTC. You have to keep it on the exchange though. 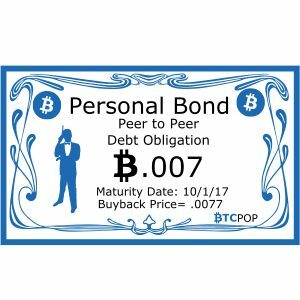 Do you want to borrow BTC, or lend it to earn interest?